The Schwinn 438 elliptical trainer carries an honorable brand name that’s been around for years. Schwinn is a division of Nautilus and has the same quality and high standards. 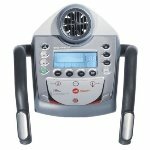 This elliptical machine is a reliable performer in the mid-level price range, coming in at around $1,300. You can usually shop around and get it on sale for around $1000. 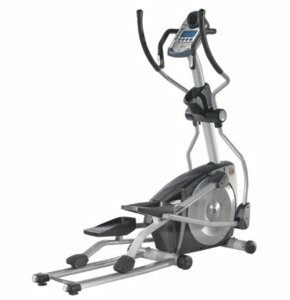 While there are some reservations, most fitness experts feel that the Schwinn 438 elliptical trainer is a solid machine with a good performance record. The main problem they seem to have is the interesting contrast between the wide variety of pre-set programs, which is outstanding, and the relatively narrow range of resistance levels (8). Jumping from one resistance level to the next can feel like quite a shift in your workout. UPDATE: The Schwinn 438 has been discontinued and replaced with the popular 430 model. Read our review here. In-home users appreciate the Schwinn 438 elliptical trainer’s articulating foot plates, which support the heel properly through the entire elliptical motion. The adjustable handlebars are also a plus for maximum comfort. There is some fierce competition in this price range, but the Schwinn 438 holds its own. If you like to change up your workout to stave off boredom, this could be the elliptical trainer for you. With 24 workout programs, it will take a long time to burn out on any one routine. We also like the machine’s combination LCD/LED display, which packs lots of information onto the console in an easy-to-use manner. The 438’s eddy current braking system is what you would expect in a high caliber elliptical trainer, and it provides a quiet, smooth ride. We have reservations about Schwinn’s complicated warranty, though. Notice that “wear items” are covered for only 6 months. Well, hey, aren’t those the parts most likely to need replaced? Overall, we would say this is a good performer with some excellent features. It’s one of several in this price range that will give you above average performance for the price. Do some comparison shopping to see which elliptical is right for you at this price point. If you choose the Schwinn 438 elliptical trainer, you’ll be happy with it.